–1– The dreaded muster/safety drill. 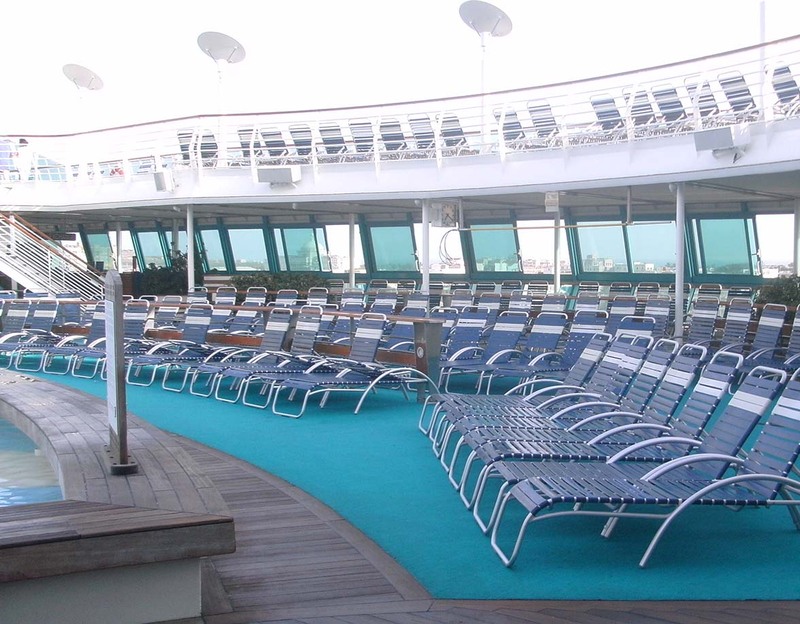 As soon as the ship gets underway, all passengers are required by international law to participate in a safety drill. They must go to their cabins and retrieve life jackets for everyone and head directly to a designated spot to hear safety instructions. Crew members check off everyone’s name, so there’s no getting out of it — and rounding up every last passenger can take quite some time. On recent cruises aboard Princess Cruise Lines and Celebrity Cruise Lines, passengers met in a theater and sat in plush chairs while crew members demonstrated the life jacket procedure. That was much more comfortable, although we had no idea where the lifeboat we were to use was located! I don’t know if Carnival and Royal Caribbean (where I’ve endured many long, hot, outdoor muster drills) have changed their policies to do the training inside — but I do know the outdoor drills sucked. Many times, I’ve had to resort to climbing two or three decks above the pool to lie in the blazing sun — when the point is to be near the pool so you can go in periodically and cool off. Crew members are very reluctant to remove towels that have held a spot for an invisible person for hours, for fear of upsetting people (and diminishing the tips they rely on); so there’s no solution to the problem. I just know the minute I personally remove a towel on an empty lounge chair and settle in, an angry, 300-pound bruiser will come and beat me up! The photo above was taken in the evening, but during the day every single chaise lounge would have a towel or a person on it! –3– Limited onboard supplies/clothing for sale, if you forget something or your luggage is lost. My luggage was lost on a recent 7-day Mediterranean cruise (and returned 121 days later), and I can tell you first-hand that there are very few day-to-day vacation items you really need for sale aboard a cruise ship. No socks, no underwear, no shorts, no curling irons, etc. And the things they sell are impractical and grossly overpriced. You usually can’t get items you need in gift shops on most shore excursions, either. –4– Lame variety shows. I’m sorry, but I just can’t stay awake during one of those singing and dancing revues. Give me a magician or a comedian any day. –5– Embarrassing photos taken onboard and ashore. During dinner, a guy dressed like a pirate comes around to guests and holds a dollar-store plastic sword to their throats while a ship photographer takes a photo. And the crew displays it so you can buy it (??) — and everyone else can see it. When you disembark the ship at each port, opportunities abound to take embarrassing photos. I’ve been pressured to pose with two shirtless young men dressed as Mayan gods, women with baskets of fruit on their heads, and many other strange costumed people. I did, however, resist the opportunity for a photo op holding a large, live iguana wearing a diaper! If the photos happen to be good, they’re a pretty expensive (but unique) souvenir. –6–Less-then-ideal tablemates in the formal dining room. I took a 3-week cruise once and was assigned to sit with an elderly couple from Australia who had such thick accents that all I could do was nod and smile during the two-hour meal. Had no idea whatsoever what they were saying, and didn’t go back. Another time, I was seated at a table full of men who were each traveling alone. (That wasn’t as fun as it sounds — it was really stressful trying to make conversation with a bunch of guys who didn’t know each other and didn’t appear to be very social.) Didn’t go back. My friend was cruising solo and was seated at a table for two — alone. Nothing like drawing a little attention, huh? You can go to the maitre d’ and request a different table, but it’s hard to find him and awkward if you run into your previous table mates or they see you eating at another table. Or you can, like I usually do, simply go to the alternate “casual” dining room for future meals. Now, most of the ships have an “anytime dining” policy, which lets you eat when you like and sit with different people every night — which, in my opinion, is a big improvement. If you run into people you enjoy, you can arrange to meet them on subsequent nights and sit together. If not, there’ll be somebody new at the next meal. 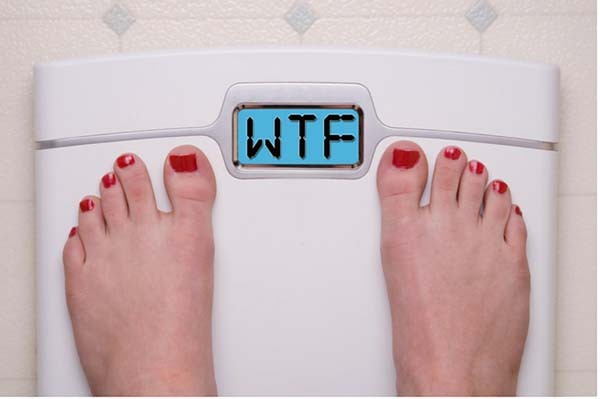 –7–Gaining weight. Did I mention that you can eat all day and all night? It’s really easy to get carried away… and the party’s over when you step on the scale at home. –8–Getting the bill the last night. All those drinks and treats you bought by using your “ship card” — and the shore excursions you took — create a surprisingly high total on your final bill. –9–Returning home. When you get home, want a drink delivered and start waving your hand to call for the cabin boy, he’s not there… and you have to turn down your own covers at night. Despite the annoyances on this list, I think cruising is definitely the best way to vacation! 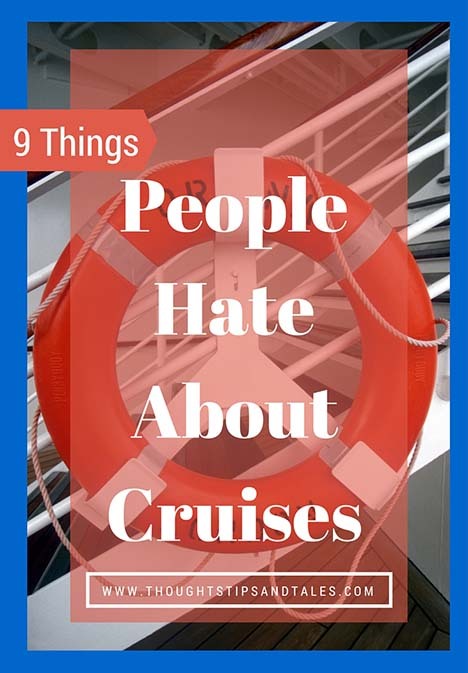 This entry was posted in cruising, cruising solo, travel, vacation and tagged bad things about cruises, things people dislike about cruises, things people dread about cruises, things people hate about cruises. Bookmark the permalink. Thanks for sharing. I had nothing but pleasure on my last cruise. I enjoyed the food 24/hours. I had never seen such great hospitality. It was just awesome. Oh – I think 95% of cruising is fabulous! These are just basically minor annoyances, but the rest is all good.